Toddler Approved! : Read Across America Book Week: Pinkalicious! Read Across America Book Week: Pinkalicious! 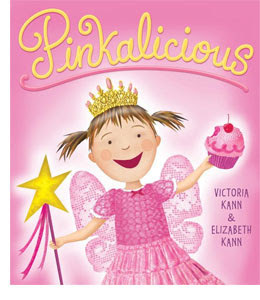 Pinkalicious by Victoria & Elizabeth Kann is darling book and seems to be all the rage with little girls lately. We decided to do two Pinkalicious projects today after reading the book. It was my first time reading it and I thought it was adorable... especially when my little niece would chime in and answer my questions with her cute high pitched voice. My son actually really liked the book as well and listened to the story intently, even though he was busy playing with toys while we read. 1. Use dot markers to paint each cupcake. We painted 2 cupcakes in each color. My niece was so fascinated by the markers that she would just stop and turn them around and stare at them... and then go back and do more dotting (while she would say, "dot, dot, dot"). 3. Cut out the cupcakes. I did this for the kiddos (while they played) since they are 3 and 20 months and not great with cutting yet. 4. Glue heart doilies on the back of the paper plates. We just used the heart doilies to jazz the plates up a bit... you can omit them if you are worried that they might confuse your child when they are trying to match the cupcakes. 5. Put glue on top of each doily and then stick the painted cupcake on top. 6. Pat it down to make sure it stays put! 7. Let the paper plates dry. 9. Have the kiddos hunt for the cupcake plates. When they find one, talk about the color of the cupcake. Have them try and find the matching cupcake and then put them in a little pile together. 10. Once you've found all the cupcakes and matched them all by color, hide them and play again! Wow! We played this game at least 8 times. By the end my little niece was only interested in the hunting part (not the matching part) and my son was only interested in beating his cousin to the cupcakes. The races to find the cupcake plates definitely tired them out! The color matching part of this activity was really easy for my 3 year old, so if I were doing this again with him I would add patterns to the cupcakes so that we could practice more complex vocabulary words (zig zags, polka dots, etc.) and phrases (find the cupcake with the pink top and brown bottom). This activity was primarily geared towards my almost 2-year-old niece and I was just pleasantly surprised that my son wanted to participate at all. I loved how much fun a simple color matching game could be... especially playing it together with a cousin! Materials Needed: pink foam sheets, foam stickers (we used a princess pack), sequin stickers, sparkly star stickers (and anything else fun and sparkly you want to decorate with), dowel, scissors, double-sided tape, pink ribbon. 2. Decorate both stars and make them Pinkalicious... or at least as pink and sparkly as you want them to be. My niece especially liked the sparkly gems. She needed some help getting the backing off the foam stickers though since they can be challenging for little fingers. The pictures you see are from my example wand. I didn't end up getting to make the wand with her because I had a date with my husband... but her grandma made a wand with her after her nap. The decorating part is the easiest for little ones. Some of the next steps require a help from an adult. 3. Cut off some ribbon and tape it to the top of a dowel. 4. Cover the backs of the stars with double sided tape. Tape the dowel to one star... then press both stars together (taped sides sticking to each other). Voila! Your pinkalicious wand is ready to perform some magic!... or at least help you eat some pink cupcakes! I also tied the ribbon together to make a little bow. If you have more time and supplies than we did... you can also have your child paint the dowel pink! We unfortunately forgot our pink paint at home. What other Pinkalicious activities have you tried?